One of the quickest paths to an indulgent dinner, when you’re staring at little more than one vegetable in your fridge, is to think: braise. 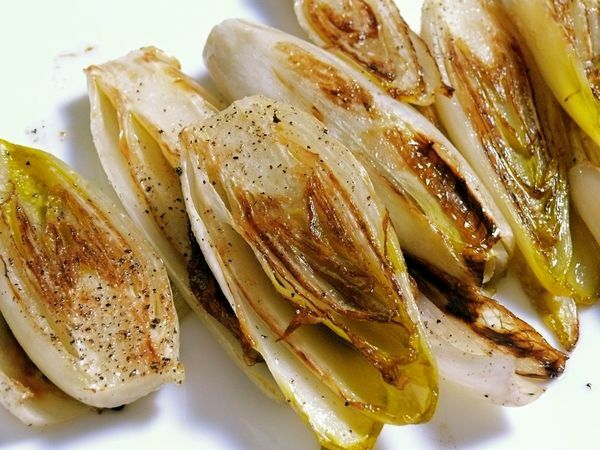 Fennel, endive, leeks and other firm vegetables that caramelize nicely are among my favourites to braise, but squash, Brussels sprouts, broccoli, portabellos–there’s no reason you can’t braise any of these. Less watery vegetables work best because you want them to spend a little time in the pan browning, before you add liquid to finish cooking them and that goes for any liquid they might release as well. It’s quite simple: add some fat to a hot pan (a combo of butter and olive oil works well), add your vegetables without overcrowding and without stirring or turning too soon, to create as much browning and caramelizing as possible on every surface. Season with salt, pepper and any herbs you’d like while you wait. Then add wine, broth or even water to stop the browning and let the vegetables cook without burning. You can cover and let the liquid do it’s job and reduce on the stovetop. Or for larger portions, you can transfer the vegetables to a baking dish and finish cooking them in a preheated oven. Finish them with a fancy cheese, if you’d like, maybe even some breadcrumbs too and put them back into the oven to gratinée them. Or do what I did last week (pictured above), eat them plain, hot out of the pan with just a piece of crusty bread to dip into that delicious braising liquid and call it dinner. Previous Articlenew to the NEW le sauce? Yum – those look so good! Wonder if the kids would eat them…. will report back!